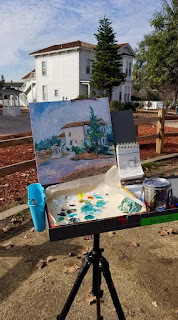 Being an outdoor painter, checking the weather forecast is very important. It was a beautiful day yesterday, I didn't bother to check and was excited to find a great new nature preserve. There were many kinds of birds, the dramatic sky, distant mountains... What a perfect place to paint a landscape in watercolors. Marilyn saw me painting and took a photo of me, she mentioned that it was going to rain. It did start raining only a few minutes after she left. I was crazily in rush packing my staff, while a nice gentleman was passing by and offered if he could help. I should say thanks instead of "No! ", and wished he were an umbrella... It is so easy to miss an opportunity to show one's appreciation. I hope to meet this person again to say a big Thanks! So far I have been quite spoiled with our lovely California weather. 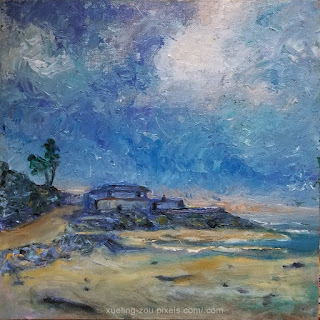 I really am grateful in life, no matter little thing or big, they all inspire me to paint. It was gray, not a cold day. Beautiful campus at the old mission Santa Clara. I didn't realize that school started already. It took me a while to park my car. 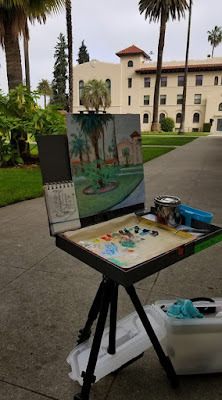 I had been to this campus many times, so I found a lovely spot to paint. Some flowers were blooming already, the trumpet flowers and palm trees in front of my eyes. Everything looked great, but I needed to go to the restroom. I tried not think about it and focused on painting. This natural physical challenge was not easy work around... I would finish this painting at my studio. 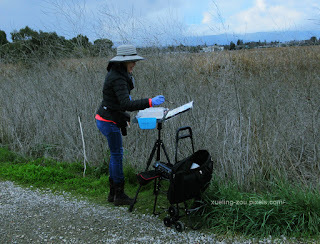 Plein Air @ Moran Lake, Santa Cruz, CA. 加州风景油畫寫生. It wasn't warm, about 50 degrees this morning. There were many surfers at the beach already. Some of them were not young, still so brave. I really admire them all. Light is the source of the reality, can change the way you look at everything. 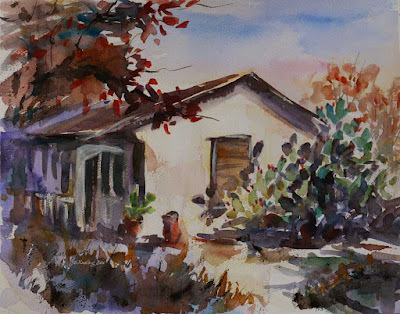 Later the sun came out, felt warm, but my painting didn't look right any more... It was the challenging part of painting out. I've learned for years that creating a good piece of art, artist should respect one's own emotion first. What do you think?